Are you conducting or publishing research on teaching and learning? Do you know someone who is engaged in SoTL work? The Faculty Development Center invites individuals who are interested in the scholarship of teaching and learning (SoTL) to submit a proposal or nominate faculty to facilitate a session during our next Love of Learning Brown Bag Research Series. The three-session series will be held in February, March, and April of 2019. In fall 2005, the Research Policy Committee — the university standing committee charged with making recommendations to the provost regarding policies concerning research — joined forces with the Office of the Provost and the former Office of Undergraduate Research and Scholarly Activity (now Office of Research and Scholarly Activity, or ORCA) to begin a presentation series that highlights the individual research agendas of MSU's faculty and staff. The presentations, which take place each month, features one presenter and a lunch (resources allowing). The location varies. 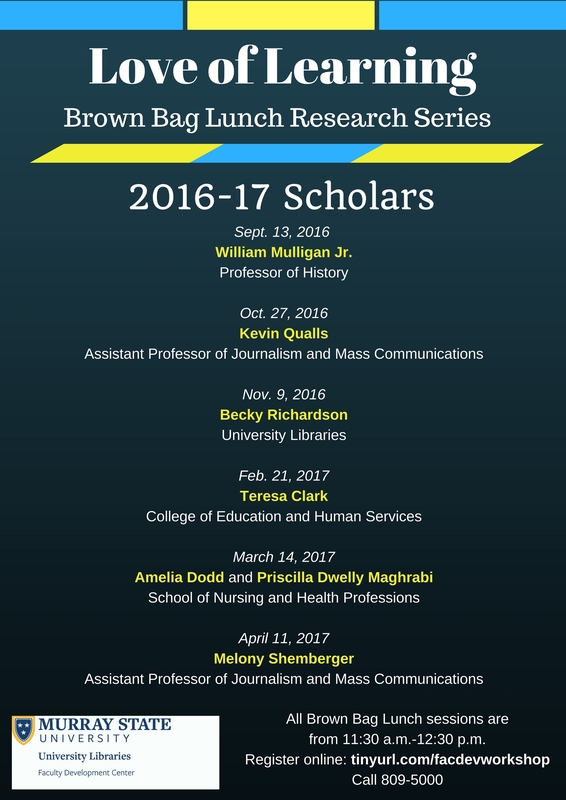 Anyone interested in presenting at a Love of Learning Brown Bag Lunch Series is encouraged to share that interest and should contact the Faculty Development Center directly at msu.facdev@murraystate.edu or call 809-5000 to volunteer to lead a session.